The award ceremony for the sports honors concluded yesterday with the Khel Ratna, and Arjuna Awards presented to those sportspersons and athletes excelled in their respective sports field. The athletes honored with these awards were outstanding in their jobs and had established themselves in the sports field. Not just this, but these talented Indian sports persons have also waved the tricolor high. In the award ceremony, the Indian skipper and tremendous cricketer Virat Kohli honored by the prestigious Rajiv Gandhi Khel Ratna Award. He was bestowed the award by the Honourable President Ram Nath Kovind at the Rashtrapati Bhavan on Tuesday. The 29-year-old cricketer has been a batting maestro, who helped the team India to win many matches. Plays the ODIs, Test Cricket and T20 Matches and with 35 centuries on his name already, Kohli is a real gem for the nation. According to the ICC rankings, he is currently reigning at No 1 position in the world. Kohli was present with his mother Saroj Kohli and his wife and actress Anushka Sharma. President Ram Nath Kovind also delightedly confers the honors of Rajiv Gandhi Khel Ratna Award to the weightlifter Mirabai Chanu at Rashtrapati Bhawan. The superb athlete won a gold medal in the 2018 Commonwealth Games along with a gold medal in IWF World Championship that took place last year. Chanu is also a 2014 CWG silver medallist. The talented badminton player N Sikki Reddy cannot be more delighted as she was awarded the Arjuna Award for her explicit performance and contribution in the sport of badminton. The shuttler won a bronze medal at the Commonwealth Games in the doubles event, and also won gold in the Mixed team category in the same game events. 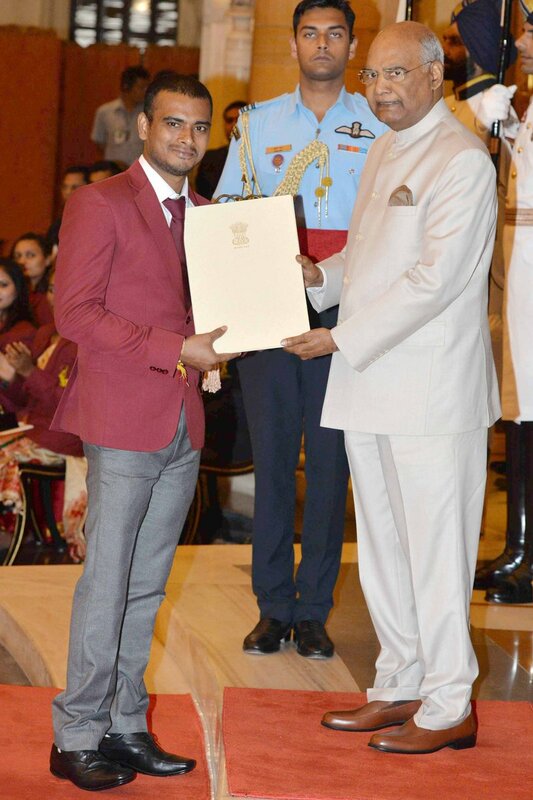 The fantastic Javelin thrower Neeraj Chopra was bestowed by the prestigious Arjuna Award at the 2018 National Sports and Adventure Award function at Rashtrapati Bhawan, New Delhi has bagged gold medal twice at the 2018 Commonwealth Games and Asian Games 2018 and holds the national record. The Junior World Champion sprinter Hima Das was honored with the Arjuna Award by the President of India. The girl who belongs to a small village of Assam waved the Indian flag high and had made the entire nation proud. The Indian Army brat is not only serving the nation by sacrificing everything for the nation like his other soldier brothers and sisters, but he has also made the nation proud in the athletics. He won silver in the 800 m event and gold in the 1500 m event at the Asian Games 2018. The gold medallist shooter at the 18th edition of the Asiad, Rahi Sarnobat was also awarded the Arjuna Award for her achievements and contribution to the nation. Previously, Rahi conquered a bronze medal in the 2014 Asian Games. Manika Batra, the Table Tennis player, was also honored with the Arjuna Award 2018 at the National Sports and Adventure Award event 2018, held at Rashtrapati Bhawan in New Delhi. This year, the player won four prestigious medals out of which, one is from the Commonwealth Games 2018. Apart from this, the Hockey star Shri Manpreet Singh was also conferred with Arjuna Award. At the Asian Games 2018, he won a bronze medal (Men Team), Gold Medal (Men Team) in Asia Cup 2017, Silver Medal (Men Team) in CWG 2014 and Gold Medal (Men Team) in Asian Games 2014. For Table Tennis, G Sathiyan also won Arjuna Award 2018, for his contribution in the sport. He has won a gold medal (Men Team) in CWG 2018, silver medal (Men Doubles) in CWG 2018, bronze medal (Mixed Doubles) in CWG 2018 and bronze medal (Men Team) in Asian Games 2018. In Hockey, Savita Punia was also awarded Arjuna Award for her incredible achievements in the sport. President Ram Nath Kovind bestowed Arjuna Award to Shubhankar Sharma for his explicit performance in Golf. Here is the full list of the awards given in various categories by President Ram Nath Kovind at the National Sports Awards.